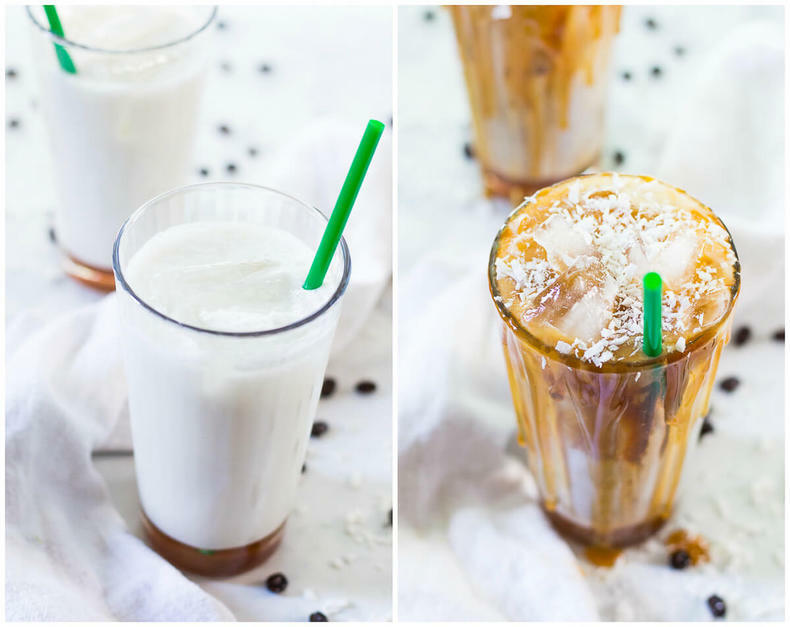 These Salted Iced Coconut Milk Caramel Macchiatos are a delicious dairy-free version of your new favourite Starbucks-inspired iced coffee recipe! 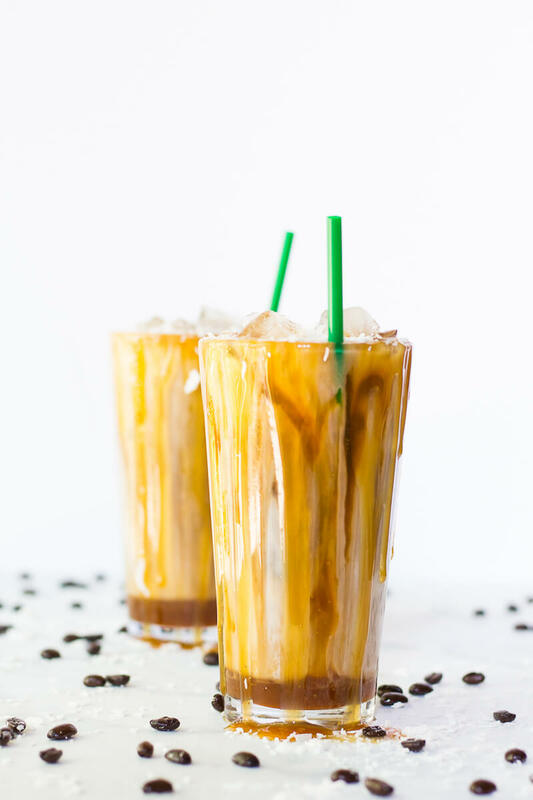 These Salted Iced Coconut Milk Caramel Macchiatos are basically what my ideal Saturday afternoon looks like. No matter the weather even…sun out, me on a patio chair, one of these in my hand. Alternatively, a cozy rainy day, me snuggled into a giant duvet cover watching Netflix, and again, one of these in my hand. There's something about me-time and luxurious, over-the-top afternoon coffees that just go together so beautifully. I mean, September is always kind of wishy washy in terms of the weather. Sometimes you get a glorious warm, sunny day that feels like summer, and sometimes it's cold and grey as if fall has suddenly descended without warning whatsoever. So this is basically kind of the last weekend of summer for me – I'm taking a whole day off of blogging *gasp* and heading up north with the girl squad to a cabin on a lake about three hours from Toronto. I'm sure there will be some of these veggie crostinis there, or maybe a little one pot mac and cheese action. And I have like TEN of these homemade fudgsicles in my freezer that I'm trying to get rid of so hopefully they make it in the cooler on the car ride up. Mostly, I just hope that the weather holds out! 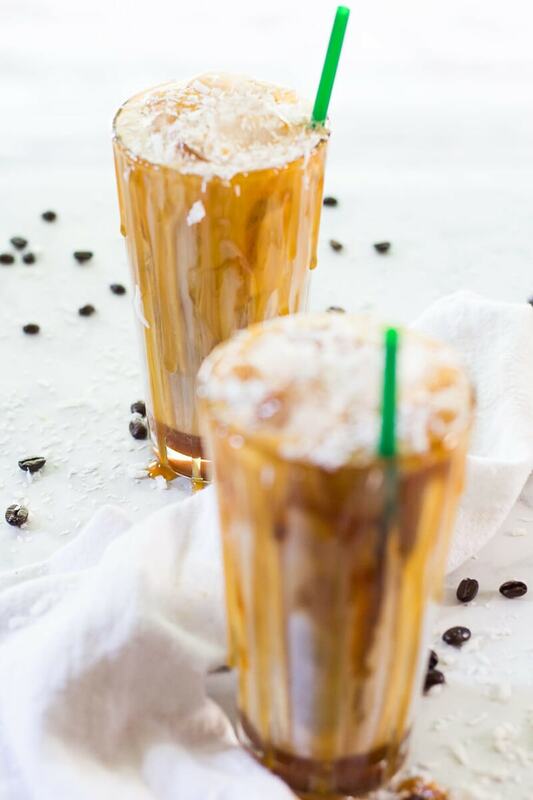 Anyways, the story behind these Salted Iced Coconut Milk Caramel Macchiatos. Right.. So on my last road trip up to Canadian cottage country a few weeks ago with my family, we *of course* had to stop in for a Starbucks and bathroom break halfway there. And somehow, I totally missed the company's latest concoction: you know, those delicious sounding Salted Iced Coconut Milk Mocha Macchiatos?! I was beyond excited to see a new drink on the menu (maybe less thrilled about the price hehe), but I was also kinda bummed to see the drink was a MOCHA. Don't kill me, but I'm not exactly the biggest fan of chocolate coffee drinks, so I didn't order one. I mean, I LOVE iced coffee (clearly!) and I love chocolate, but I kind of hate the two mixed together. And I already love iced caramel macchiatos, so switching up my usual coffee order TOO much is just something I can't get used to. But I was intrigued with the idea of a dairy-free macchiato, and one that used coconut milk at that. Have I even mentioned my serious coconut obsession? Gimme it in dessert form, coconut water form, curry form…any form really. But mostly, just gimme one of these things right now….Bonus points if you deliver! 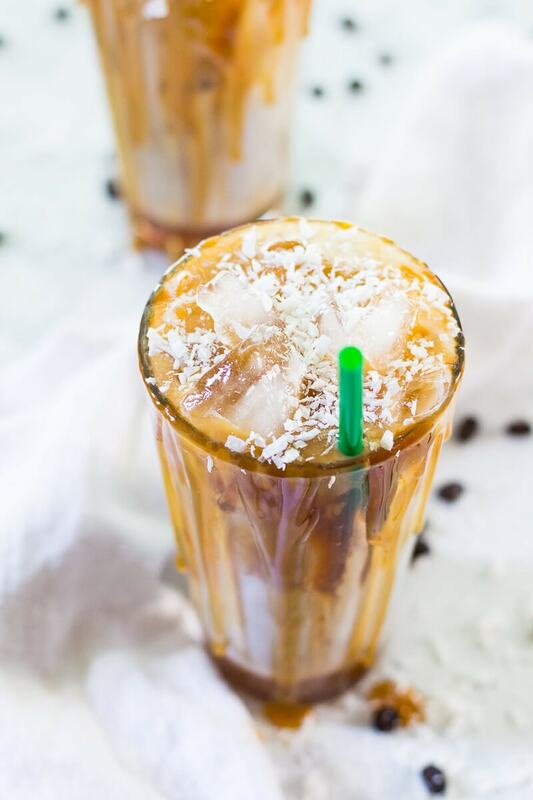 Will you be making these Salted Iced Coconut Milk Caramel Macchiatos? 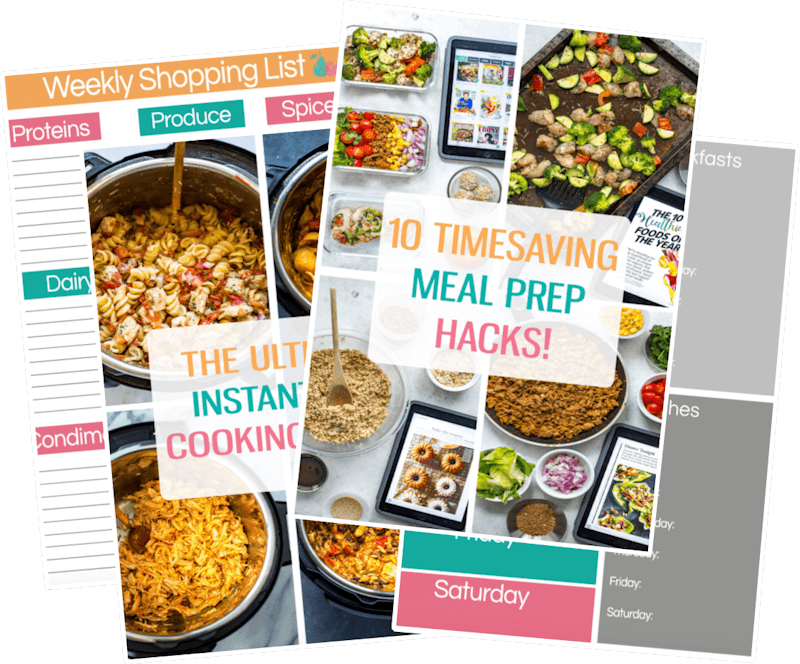 If you try any of my recipes be sure to let me know on Instagram, Twitter or Facebook! Mix together caramel syrup, then divide mixture in half, adding each half to the bottom of two tall glasses. Add ice, then pour about 3/4 cup coconut milk (more or less depending on your preference) to each glass. 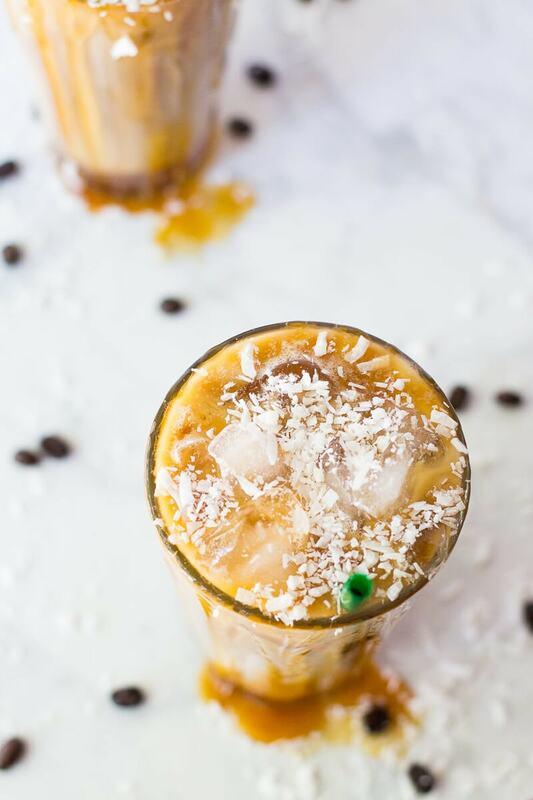 Pour one shot espresso slowly into each glass overtop of ice and coconut milk. Drizzle with caramel syrup, then sprinkle coconut flakes overtop (if desired). 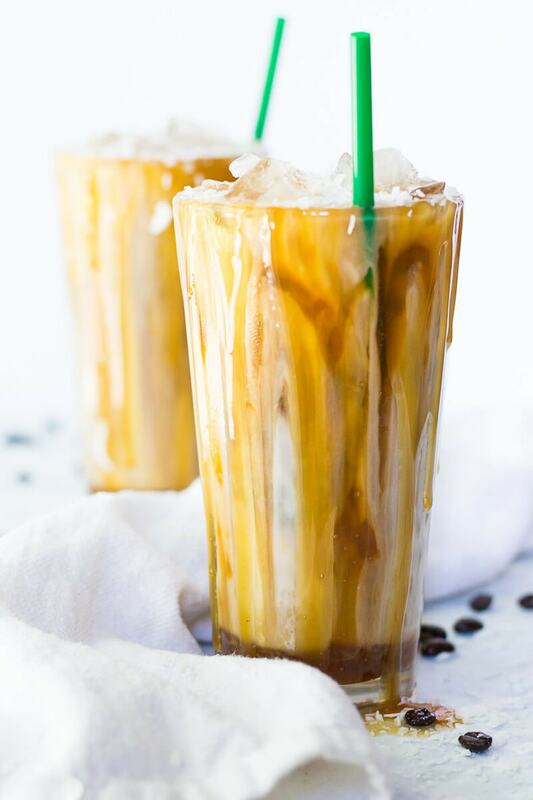 Iced Coconut Milk Caramel Macchiatos for the win!!! These are just gorgeous! 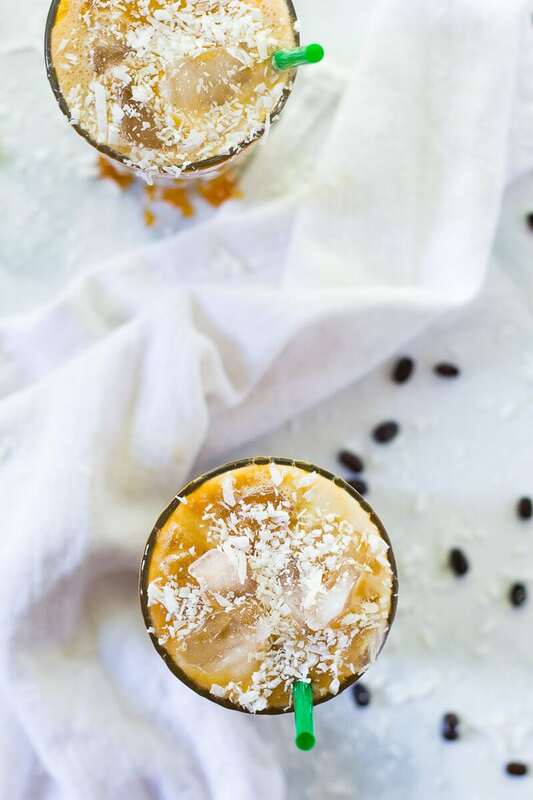 I am such a sucker for coffee and coconut together. Have a great trip! 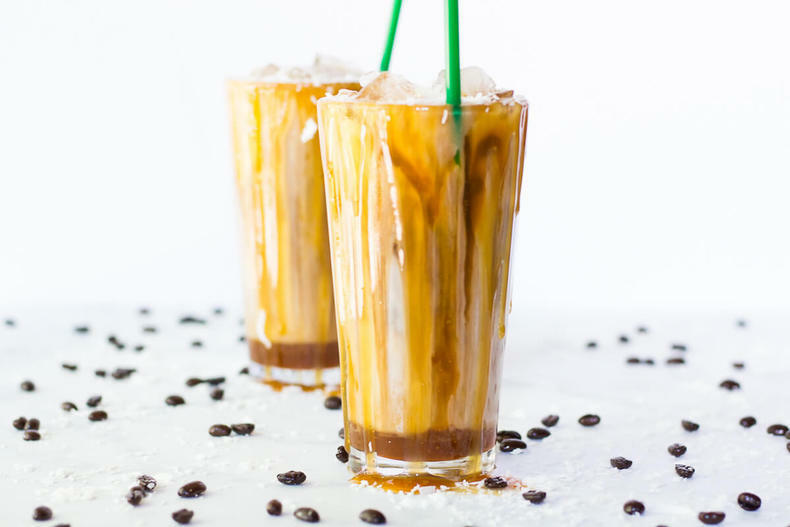 I love the caramel drinks at Starbucks too – I was so excited to have a work meeting at Starbucks on Friday so that I could get a caramel frappuccino! This drink looks divine. Anything with coconut milk has me sold! That looks scrumptious! Looking forward to giving it a try here soon! Thanks Melanie! 🙂 Let me know if you do give ’em a try! I kept meaning to pop into Starbucks to try that drink, and then never did and was so bummed out about it. You just made my day! I think I’d like your version so much better! I am also completely coconut obsessed!!! 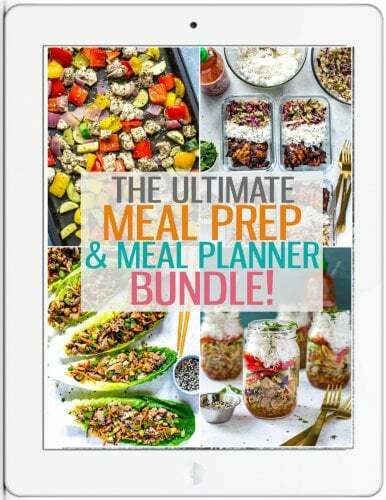 Pinning this so I remember to try the recipe soon! Would it work to use canned coconut milk instead? Hi April! The flavour would honestly be very different and it would be much higher in calories, probably creamier too. It’s up to you to decide if you want to try it this way – I recommend the carton version but that’s not to say you wouldn’t like the canned version. It’s just usually used more in cooking than in drinks!